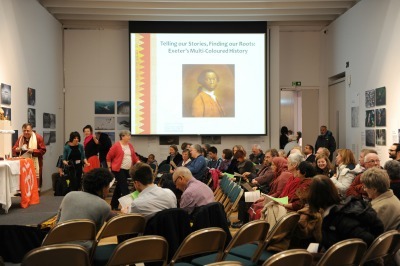 "it was a really good event for all the community to know each other and be together"
"listening to stories of other people's encounters - like ours - in and around Exeter...well put together and indeed inspiring"
"meeting the multi-cultural population of Exeter""the food! Seriously - so nice to se so much diversity in one place"
"the atmosphere music and singing, inspiring stories"
"meeting people of many different cultures. Hearing their stories was very moving , deeply moving"
"the singing was amazing! and the food! speakers were very brave"
"great location and well-presented - more please!" "the sense of unity and equality among the people involved, and the music...it was a wonderful evening where I learnt a lot and experinced may emotions"